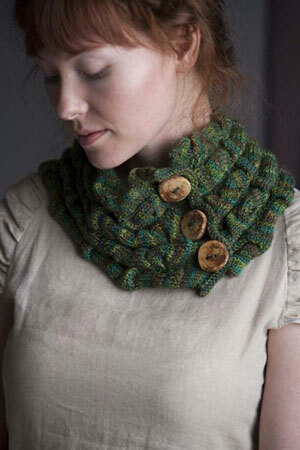 Taken from Knit.Wear - '12 Spring: "The unique scrunch stitch texture adds warmth and interest to this buttoned cowl." This pattern is from Knit.Wear - '12 Spring, pg. 107. US 7 straight needles (or size needed to obtain gauge), an extra DPN at least two sizes smaller than the main needle, one tapestry needle and three 1.25" buttons are required but not included. Finished Circumference Measurement (buttoned): 24"
Gauge: 27 sts and 32 rows over 4". We recommend using Madelinetosh Tosh Sock in Filigree.